Welcome to Vaticanum.com, the international catholic online store. 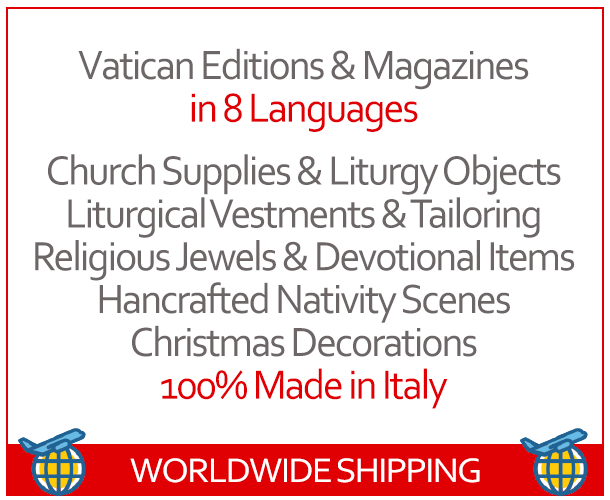 Vaticanum.com offers thousands of products in the following main departments: Vatican Books & Journals in 8 Languages, Subscriptions, Liturgical Vestments, Clergy Clothing, Ecclesiastical Fabrics by the yard, Holy Furnishings, Religious Articles, Liturgical Accessories, Church Supplies, Religious Jewels, Christmas, Val Gardena Nativities, Nativity Scenes for the home or for Churches. All our articles are produced only and exclusively by the best Italian artisan workshops and are characterized by excellent quality and excellent price/quality ratio. 100% Made in Italy guarantee.